KBB.com 10 Most Awarded Brands. This Chevrolet Silverado 1500 delivers a Gas V8 5.3L/325 engine powering this Automatic transmission. ENGINE, 5.3L ECOTEC3 V8 WITH ACTIVE FUEL MANAGEMENT, DIRECT INJECTION AND VARIABLE VALVE TIMING includes aluminum block construction (355 hp [265 kW] @ 5600 rpm, 383 lb-ft of torque [518 Nm] @ 4100 rpm; more than 300 lb-ft of torque from 2000 to 5600 rpm), Wheel, full-size spare, 17 (43.2 cm) steel, Transmission, 6-speed automatic, electronically controlled with overdrive and tow/haul mode. Includes Cruise Grade Braking and Powertrain Grade Braking. *This Chevrolet Silverado 1500 Comes Equipped with These Options *Transfer case, with floor-mounted shifter (Included with 4WD models only. ), Tires, P255/70R17 all-season, blackwall, Tire, spare P255/70R17 all-season, blackwall (Included and only available with (RBZ) P255/70R17 all-season, blackwall tires. ), Tire pressure monitoring system (does not apply to spare tire), Tire carrier lock, keyed cylinder lock that utilizes same key as ignition and door, Teen Driver mode a configurable feature that lets you activate customizable vehicle settings associated with a key fob, to encourage safe driving behavior. It can limit certain vehicle features, and it prevents certain safety systems from being turned off. An in-vehicle report gives you information on your teen's driving habits and helps you to continue to coach your new driver, Tailgate and bed rail protection cap, top, Steering, Electric Power Steering (EPS) assist, rack-and-pinion, Steering column, Tilt-Wheel, manual with theft-deterrent locking feature, StabiliTrak, stability control system with Proactive Roll Avoidance and traction control includes electronic trailer sway control and hill start assist. 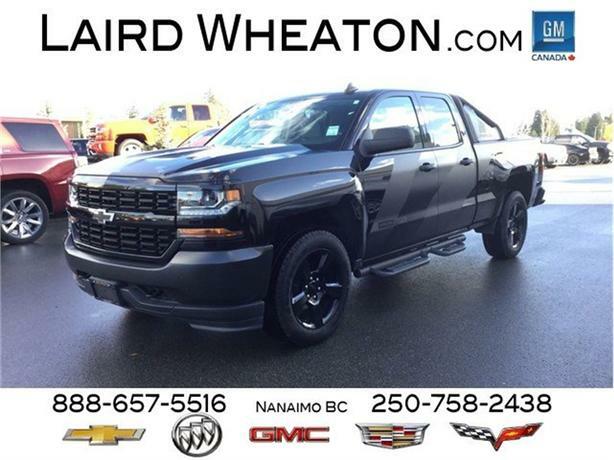 * Visit Us Today *For a must-own Chevrolet Silverado 1500 come see us at Laird Wheaton, 2590 Bowen Road, Nanaimo, BC V9T 3L3. Just minutes away!